Peaceful country setting with lots of room for even the biggest rigs. NO RIG TOO BIG! Beautiful beaches, outlet shopping, Pensacola & Mobile just minutes away. The Naval Museum, USS Alabama, Casinos & great dining nearby. We stopped overnight heading to Florida. We were greeted upon arrival and quickly set up and went to the office to take care of the paperwork. We love this place. We walked around, and talked to some extended stay folks. Everyone is friendly. We will come back again. Very clean, well kept grounds. Cannot say enough about it. Our second visit. Still a beautiful campground with long and wide sites. There are some overnight or short term sites with concrete pads. The restrooms are very clean and well-supplied. Did not use the laundry this trip. Plenty of room to walk around. There’s a Camping World in Robertsdale (about 8 miles away), a Publix Market and a large shopping center in Spanish Fort (about 20 miles away), and a large Tanger Outlet in Foley (about 30 miles away). Gulf Shores is about 30 miles away. There are several restaurants in the area (Spanish Fort, Foley, and Gulf Shores). 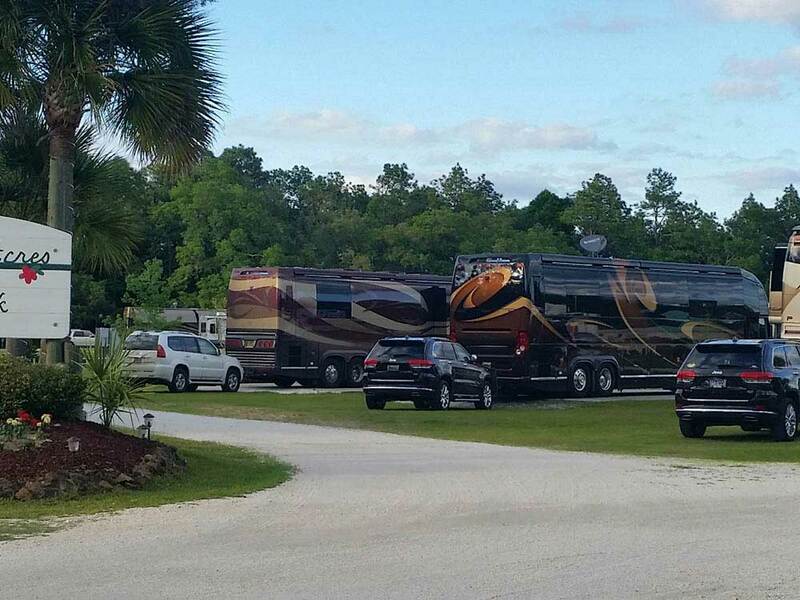 Much of the campground is taken up by snowbirds so, if you are interested in visiting, make your reservations early. We would return. This campground lives up to its reputation as the Gulf Coast's Best Kept Secret. The sites are huge and can accommodate any size rig. Some sites have picnic tables and concrete pads, but not all. The restrooms are clean and modern (the campground is only about 8 yrs. old). All sites are full hookup but my husband says the one urinal and 1 commode in the men's room is not adequate as a line forms every morning. The laundry is clean with industrial grade washers and dryers. There is minimal shade but here are trees planted that will eventually correct that problem. It is only about 25 miles to the Gulf Shore with all the restaurants and shopping and even closer to the Causeway over Mobile Bay with restaurants and shopping in Spanish Fort, Fairhope and Foley (including a Tanger Outlet. There are many seasonal campers so reserve early if you plan an extended stay. One can usually get short term accommodations if they call ahead. It is owner-managed and is being constantly improved and is very attractive with flower beds, seasonal shrubbery (mainly azaleas and roses), and the like. And, there is a pizza maker who will deliver to the campground several evenings a week. The owner organizes monthly get-togethers (ice cream socials and pancake breakfasts for example). We really enjoyed this park. Located away from highway noise, so quiet. Absolutely great showers. Very prettily landscaped. Friendly service and the other campers were very friendly as well. The only complaint we have is that the last night, they got the lights working on the front trees, brightly shining in our windows all night long. Irritating. We only were there passing through for one night, but it was very nice. The manager had us call when we were a few minutes away then met us up front and showed us to our site. The next day, we were having trouble getting our big slideout in. My husband was having some medical issues and was unable to get on his knees. The owner was tending her beautiful roses and sent a gentleman to help. He was able to get it in so we could be on our way. The park is nice, mostly level gravel site. It was very clean and the wifi was very good. Nice quiet, clean, and friendly RV Park. Ideal location for visiting Gulf Shores, Orange Beach, Mobile, and Pensacola. Would definitley stay here again! This is clean park, sites are fairly level. Office staff was very friendly and helpful. Restrooms were very clean and modern. For an overnite stay it can't be beat. Price was great! Basic facilities done well. Concrete pads surrounded by grass. Forested area, with azaleas and hidden garden areas. Restrooms, laundry, activity room with DVDs, games, and puzzles. Nothing extra for the kids, but they had trails to ride their bikes. Across the street is a little private zoo with lemurs and other animals. The kids thoroughly enjoyed that place, as well as the Easter egg hunt they sponsored. They even make pizza. The RV park is close enough to the freeway to be convenient, but road noise is not apparent. Using our garmin to get into the park was not the best. Had a hairpin turn to get on the right road - difficult at best in a 40 foot rig. There is a slightly longer way to get into the park that is better. The owner/manager of the park was absolutely wonderful! Even though we were there only one night, we would go back again. Very quaint park with large sites, but a little off the beaten path. Only an overnight stay, but staff was friendly and park was very clean. Some sites are grass only and others had concrete pads. There are only small trees in the center of the park. Freshly planted. The pull thrus are cement slabs that are almost flat. The rest of the parking is grass. Very well kept. The bathrooms and showers are top notch. Very big and well kept. The staff comes to meet you at the gate when you arrive and guide you to your spot. They are very friendly. Very reasonable rates. I will stay here again. My wife and I stayed at this park for one night on our way from Florida to Texas. We found it to be very clean and spacious with a friendly and helpful staff. The sites have level concrete pads for the RVs to park on...a nice touch.